The President of the United States is not flinching concerning his insistence on getting funding for US-Mexico border wall which has now led to the longest partial government shutdown ever seen in the country. As this continues, authorities keep discovering tunnels under the aforementioned border. Within the last 30 days, three tunnels were found under the border. One of the tunnels is about 50 feet in length, and it is not finished yet. This tunnel stretches across two countries – the origin is along the drainage channels that are shared by a US border town and Mexico and ends beneath a parking space in Arizona. The opening of another tunnel was found in an abandoned store in Nogales, a Mexican border city. It is 80 feet long and also unfinished. The third which was also found in Nogales is 30 feet long. Authorities said these tunnels were built to bring banned goods into the country as well as to smuggle people in. Despite the President’s consistent insistence that the border wall will put an end to illegal immigration and drug trafficking in the country, the unanimous notion amidst expert is that the border wall is not the solution. Experts say the discovered tunnels are even further proofs. A physical barrier will only stop those who are willing to play by the rules but not those who do not care about the rules according to an international relations professor at the University of San Diego, David Shirk. He said the wall would end up producing more dangerous situations because smugglers and undocumented migrants will find their ways around it. 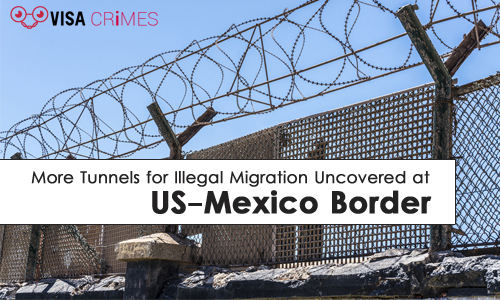 While reacting to the news of the discovered tunnels, deputy director of the Mexico Institute at the Woodrow Wilson International Center for Scholars, Christopher Wilson, said there is the need for multiple strategies. He said the wall is not going to give a good return on investment.